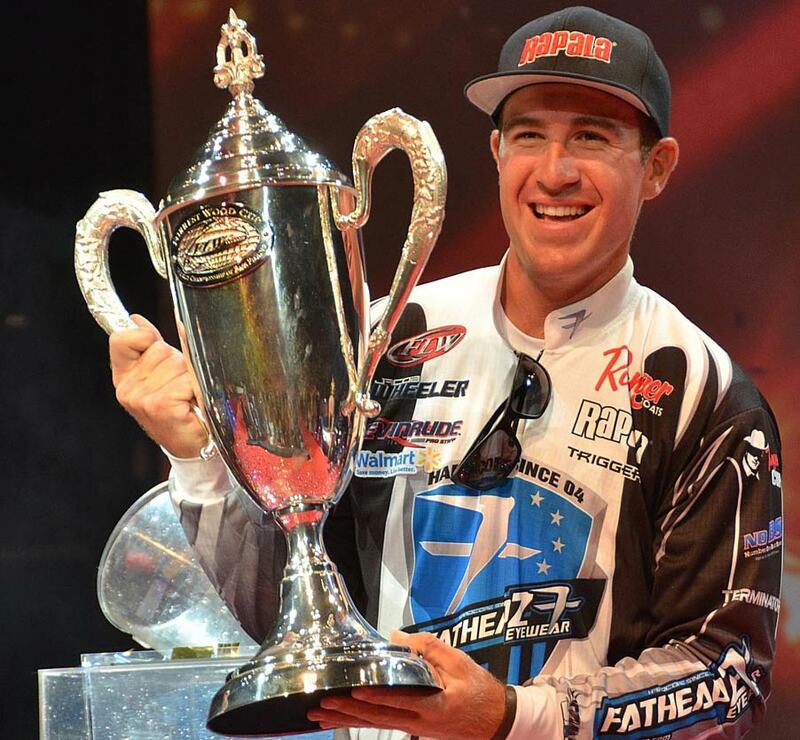 After Jacob Wheeler of Indianapolis, Ind., won the 2011 BFL All-American, the championship event for weekend anglers, he stated his goal was to someday win the Forrest Wood Cup, the world championship of bass fishing. In 2012 Wheeler made the leap to the FLW Tour, which features the world?s best professional bass anglers, to pursue his goal of hoisting the Cup. And in storybook fashion Sunday at the Forrest Wood Cup presented by Walmart on Lake Lanier, Wheeler?s five bass worth 11 pounds, 15 ounces gave him a total four-day weight of 60 pounds, 1 ounce as well as a wire-to-wire win and $500,000. ?This was just an awesome event,? said the 21-year-old Wheeler, who became the youngest angler to win the Forrest Wood Cup. ?God just really blessed me this whole event. It was just unbelievable, and this is the best day of my life.? Although it may have turned out well for him, Wheeler said it wasn?t an easy road to a championship title. ?It was a struggle today,? Wheeler said. ?I had six keeper bites all day. ?Every time I sat down to run to the next spot I might have been jittery, but I realized I had to stay focused and fish at 100 percent every day and capitalize on every single bite,? Wheeler added. Wheeler said he targeted fish on the Chattahoochee River using a variety of baits including a Rapala X-Rap Prop, flipping a Trigger X Flippin? Tube and a Chatterbait-style bait. Wheeler said he caught fish Sunday by flipping creature baits, but two of his biggest fell for a prop bait. ?The second day I caught my two biggest ones on the X-Rap Prop,? Wheeler said. ?The fish were getting accustomed to seeing bluegill-looking prop baits out there, but the elongated X-Rap Prop really showed them something different. Those fish really seemed to like that the second day, for sure.? Wheeler said he fished the river to catch a limit, then made an hour-long run to an area near Brown?s bridge to switch to fishing bluegill beds for larger ?kicker? fish. ?A lot of people fish better when they have five fish in their livewell,? Wheeler said. ?They just fish better and make better decisions, and you don?t have that pressure of worrying about that other fish on your back.? Wheeler began fishing the weekend angler?s Bass Fishing League (BFL) in 2010, qualified for the All-American championship event his first season, and won it in 2011. He moved up to the next level of competition, the EverStart Series in 2011 and advanced to the FLW Tour, the sport?s highest level of competition, in 2012. ?I want to tell all of the young fishermen out there who are trying to fish professionally that it can happen,? Wheeler said. ?Just how bad do you want it? And what are you willing to sacrifice to get it? You can do anything you put your mind to. You just have to work really hard. The BFL (circuit) was huge. I wouldn?t be here if it wasn?t for the BFL. ?I?m truly blessed,? Wheeler added. ?It?s an honor to be sitting in this (winner?s) seat right now at this age. In 100 years I never would have thought I could be sitting here next to the Forrest Wood Cup.? Straight Talk pro Scott Canterbury of Springville, Ala., posted a total weight of 52 pounds, 12 ounces to claim second place. Canterbury won $100,000 for his efforts. Overall there were 48 bass weighing 110 pounds, 15 ounces caught by pros Sunday. The catch included nine five-bass limits. Timothy Dearing of Loudon, Tenn., won the co-angler division and $50,000 Saturday with a three-day total of 10 bass weighing 22 pounds, 13 ounces followed by Josh Smith of Hamilton, Ohio, in second place with seven bass weighing 20-4 worth $15,000. FLW and the Shreveport/Bossier Convention and Tourist Bureau announced Saturday Shreveport would once again be hosting the Forrest Wood Cup, the world championship of bass fishing, Aug. 15-18, 2013, on the Red River. The last time the Forrest Wood Cup, the sport?s premier event, was held in Shreveport was 2000 and Dion Hibdon of Sunrise Beach, Mo., made professional fishing history by becoming the second man to win both major championships in the sport of bass fishing. Mark Rose of Marion, Ark., was awarded the inaugural Forrest L. Wood Sportsmanship and Community Leadership Award presented by Goodwill on Saturday, and a donation will be made to Rose?s charity of choice. FLW and Goodwill recognized the angler that exemplified the ideals of sportsmanship and community service through the 2012 season. The Forrest L. Wood Sportsmanship and Community Leadership Award recognizes the individual who displayed overall commitment of sportsmanship and community leadership, on and off the water, by displaying ethical behavior, upholding integrity, class, selflessness, conservation efforts and kindness to others. The same values that brought Goodwill and FLW together as partners inspire the high standards of this award. By recognizing this outstanding individual who set a high standard with their approach on and off the water, FLW hopes to set the tone for tournament fishing and to pass those values on to its anglers, sponsors, fans and host communities. The Forrest Wood Cup presented by Walmart was hosted by Gwinnett Convention & Visitors Bureau and Lake Lanier Convention & Visitors Bureau.